The original plan was to have a weekend rally at Craobh Haven, spend a week cruising southwards to Islay, return to Craobh and then set off northwards for another week and the Western Ardnamurchan Regatta. As the main cruise alone eventually extended to five ‘boat-fortnights’ it is inevitable that the following account can not describe adequately what everyone did all of the time. If it is written as I remember it that is because I can only be expected to remember what I saw, but I’ve tried to be fair to the others and hope that the completed article may be of interest to anyone contemplating a Scottish cruise this summer. Craobh only Jean Coaster Dave and Jean? At first it looked like being just another wet and windy Scottish rally. Although Stuart was ‘delighted and amazed’ that there were at least five boats committed for the fortnight, he did wonder at this early stage if ‘they should be committed for life’! No-one could have known that the most amazing spell of summer weather for years was lurking just around the corner, ready to delight us with dawn-till-dusk sunshine, to tease us with fickle zephyrs that wouldn’t have pushed a paper boat, and ultimately to cause the abandonment of the original plan in favour of a continuous and considerably more ambitious variation. Most of the boats arrived at Craobh Haven by road but Magic III sailed as usual, arriving after a gruelling seven hour beat from her overnight stop at Port Ramsey. 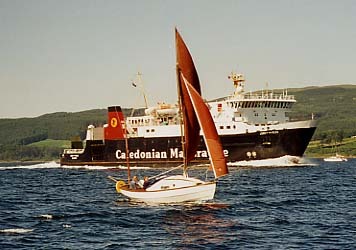 The wind was sustained at F5–6, she carried a reefed main and full genoa, survived a knockdown in the Lynn of Morvern and needed some pretty vigorous bailing on every second tack because the gunwale acted as a perfect scoop to ladle the not insubstantial seas into the cockpit. This passage provoked a good discussion later, with some owners maintaining that jib and mizzen is the proper rig for such conditions, whereas I believe that a modicum of mainsail is essential to keep the boat pointing high if you really need the drive to windward. If I were ordering my mainsail again I would make sure to specify a second set of reefing points for this reason. The following day (Saturday 22nd July) saw three Coasters ( Jean , Magic III and Tangram ), a Cruiser ( Kate ) and a Dabber ( Nokomis ) emerge from the relative shelter of Loch Shuna and out through the bubbling tidal cauldron of the Cuan Sound. Conditions in the Firth of Lorne were still quite brisk and provided us with a lively reach over to Easdale Harbour, where we rafted up for lunch and enjoyed exploring the old slate quarries and the museum ashore. Magic III was flagship for the day, although it’s by no means certain whether this honour was awarded because I took on Admiral Patrick as crew or because I’d nearly turned my boat into a submarine on the way down. Stuart subsequently left us with the flag, to be passed on daily to the boat which we felt had earned it (!) but, by common consent, it was quietly rolled up and put away after his departure. At the time of writing it is still lurking somewhere in my loft. Not everyone had come out on this day sail, with some owners preferring to stay at Craobh and prepare their boats for the fortnight ahead. They joined us later for a meal at the ‘Shower of Herring’ at Kilmelford. We were seven boats for the first couple of days, with three Drifters ( Arctic Drifter , Mochras and Wayward Wind ), three Coasters ( Innuendo , Magic III and Tangram ) and the solitary Cruiser ( Kate ) of Jim Hopwood setting sail for Crinan and the inlet of Sàilean Mòr at the north end of the Sound of Jura. A couple of other boats looking for a quiet anchorage were no doubt surprised to find us there. Tuesday 25th saw the fleet fighting the tide southwards (with Colin reporting mother and baby otters — and rocks! — on a passage inside the islands off Carsaig) towards the historic island of Eilean Mòr, which is just a mile or two off the entrance to Loch Sween. Like many things ‘mòr’ (big) in Gaeldom, the term is entirely relative with this, the largest of the MacCormaig Isles, measuring no more than half a mile from top to tail. The tiny natural harbour at the north end was crowded, to say the least; it would have been tight for three or four yachts let alone half a dozen Drascombes and a similar number of larger craft. Its unique fascination comes not only from its size and relative isolation but also from the twelfth century chapel of St Cormac and the cave inhabited by the eponymous hermit six centuries earlier still. Both are now in the care of Historic Scotland although they have lived through a more chequered history, with the chapel at one time in use for illicit whisky distilling. Tuesday evening saw four of the fleet head for Craighouse on Jura, leaving behind Jim Hopwood in Kate , who stayed at Eilean Mòr until the morning, the Wardrops in Tangram , who had limited time, and Martin Randall in Innuendo , who had to pick up his son for the rest of their cruise. Martin had originally hoped to join us for the fortnight but, although he still felt that there was some chance of collecting Edward and catching us up, the fleet’s later decision not to return to Craobh made that all but impossible and we were sorry not to see him again. Wednesday 26th started more or less at dawn for Jim with what he later described as a ‘magical’ early morning crossing from Eilean Mòr, accompanied by dolphins — and the audible sounds of their breathing — in an atmosphere of perfect peace. The rest of the day then took the new fleet of five on a short hop across to Port Mòr (so many small ‘mòr’s; this one an attractive inlet at the south-eastern corner of Islay) followed by a further crawl round the corner to the Ardmore Islands and the idyllic anchorage of Plod Sgeirean. This amazing complex of low-lying jagged reefs and shallow water, teeming with wildlife and probably best appreciated from a quiet row in a rubber dinghy, had left an indelible impression on me from a previous visit in 1981. I was relieved therefore, after persuading the rest of the fleet that it would be something special, to see that nothing had changed. Jim saw an otter here, and tells me that we Scots take our birds and beasts far too much for granted (midges excepted, although we felt the bite of surprisingly few on this trip). The wildlife was obviously one of the things which really made the cruise for him and he feels that we should be ‘selling’ it a little more forcefully to our friends in the south. 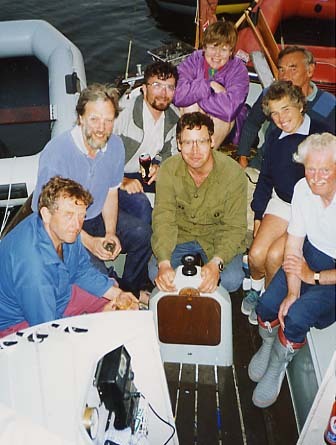 The evening was enlivened by something of a barbecue/party aboard Arctic Drifter , with Bob Menneer providing the entertainment as he first tried to set fire to the transom and then attached a camera to the mast in an attempt to photograph all eight of us in the cockpit. The result of this latter experiment can be seen above. I think it was at about this time that a definite decision was made to capitalise on both the improving weather and the ground already gained by heading west and not returning to Craobh for the middle weekend. Thus it was that Thursday 27th saw the fleet heading out with the tide through the Sound of Islay, with a lunchtime stop at Port Askaig on the way. This was no place to park a small boat on this occasion as we couldn’t get into the harbour, the water was so unbelievably deep right up to the shore that only Bob fancied his chances at anchor, and our four-Drascombe raft at the ro-ro pier came perilously close to producing a four-Drascombe kit (with Mochras at the greatest risk on the inside berth) as the lifeboat took off at high speed and left the mother of all wakes behind. An afternoon drift up the Sound, with the searing sun now beginning to make its presence felt and even the clegs flying out to sea to cool off, led to a muster near the mouth of Loch Tarbert, which threads its way eastwards for five miles or so through rocky guts, open pools and spectacular scenery to split the Isle of Jura virtually asunder. Bob and Yvonne were the last to arrive, having stopped to look at a raised beach further back, but they were still able to join Jim Hopwood and myself right up at the head of the loch that evening. Friday morning produced the last rain for weeks (if not for the whole summer!) and also a bank of self-generating sea fog, which came rolling in from the immediate south-west and led to the fragmentation of the fleet for a few days for reasons which are as follows... I had to press on as I was now committed to reaching Fionnphort at the Sound of Iona to pick up my cousin the following day, Jim also chose to keep going, but the others were more reluctant and stopped to see how things developed. Because we subsequently lost radio contact with the three Drifters, we could not be certain that they had followed us north and felt it best to treat any possible reunion as a bonus if it came. There was no way that we could lie in wait for them and hope to catch them at any one place because there are so many alternative routes and anchorages up the west side of Mull. Nightfall then saw Kate and Magic III dried out in the boat harbour at Scalasaig (more Jim’s style than mine really, but the anchorage is notoriously cramped and uncomfortable), Mochras and Wayward Wind feeling not entirely secure at Oronsay and Arctic Drifter still somewhere over on the Jura side. Thus it now becomes necessary for a while to tell first my story and Jim’s, and then the tale of the three Drifters. We left Scalasaig early on the Saturday morning, both suffering engine trouble on clearing the harbour, but soon enjoying superb reaching conditions northwards up the coast of Colonsay under full sail. A radio call from Wilf querying our plans was met with the news that we were already under way. We lost sight of the land for a while on the crossing to Mull but still arrived just nicely east of the Torran Rocks to take the inshore passage round to Tinker’s Hole. Here we stopped for a bite to eat and a look at my spark plugs, before taking the northern exit through to the Sound of Iona. If I tell you that it was well below half-tide it will come as no surprise to those who know this area that I nearly went aground on a sandbank at one point, warning Jim to take a different course as even the rudder had to come up. My cousin David was plucked from the beach at Fionnphort and we spent the rest of the day pottering about the Sound of Iona, blithely ignoring the marked channel and trying not to run into any submerged rocks (of which there are many), before returning to Tinker’s Hole. Here David and I anchored for the night but Jim dried out in a puddle round the corner. Sunday 30th took us to Staffa, where it was calm enough for a change to land and take a proper look at Fingal’s Cave, then eastwards to explore the interesting sounding channel of Ulva Ferry. 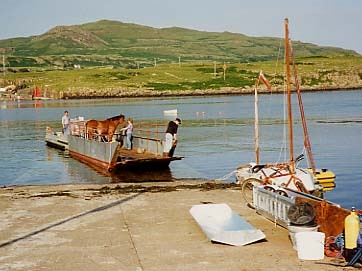 The expected rock-dodging never really materialised but the Ferry proved to be a charming place, with tomatoes growing in the phone box and a horse making the crossing to Mull in a contraption (the ferry) which is basically a landing craft pushed by a motor boat. We finally fetched up for the night at Acairseid Mhòr (yet another ‘mòr’, for the ‘h’ is merely an aspirate), the lovely northern anchorage of Gometra. Monday 31st saw us stop for a while at Lunga in the Treshnish Isles, unfortunately too late in the season to see all but the last of the puffins, before making the further short crossing to Coll. By this stage the weather had settled into a very definite pattern of calm and sunny days with the visibility ranging from quite good through to various degrees of haze and fog. The shortish sea crossings of five to ten miles, however, which we had been making ever since leaving Jura, can often be surprisingly satisfying in such less-than-perfect visibility. You just don’t have the same scope for error as you do on longer passages and the navigation can consequently be of a much more relaxed nature. We had tried a number of times since leaving Colonsay to raise the rest of the fleet on the radio but, hampered variously by the range, the lack of a line of sight and some local fishermen’s liberal and extremely frustrating misuse of channel 08, had met with no luck at all. In a moment of final exasperation, and convinced that the others must have made it across to Mull by then, I put out a call to Arctic Drifter on full power. This brought both a response from Bob and a call from Mochras requesting me to try one on low power, and so communication was re-established at last. It was probably coincidental that they had come back into range just when I went for the 25 watts. Coll was delightful as ever, with hot showers and excellent food at the hotel followed by a long, hot, thirsty walk to Torastan the following day. This choice of destination must have been suggested by David or myself as our grandfather is buried there, and we were able to take a look at his grave before striking for the coast to get Jim enthusing about that quintessentially Hebridean combination of rock, sand, water, machair and light. As mentioned earlier, Mochras and Wayward Wind had made it across to Oronsay (to the south of Colonsay) on the Friday evening. Wilf describes it as ‘a very poor anchorage — very shallow’. 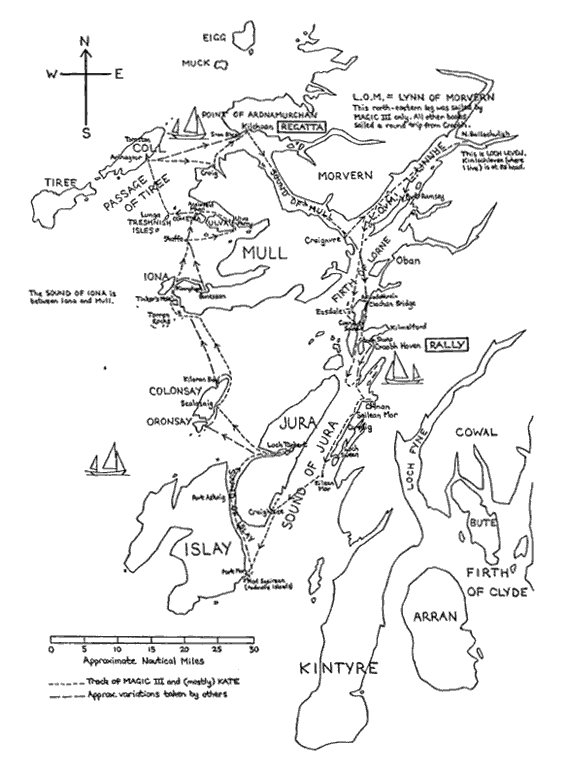 On the Saturday they headed, via a lunch stop at Scalasaig, to Kiloran Bay at the north-west of Colonsay, where they were rejoined by Arctic Drifter . This was apparently much better, being a beautiful bay and beach, but open to the north-west. The discerning reader will by now have spotted that the problem with Colonsay is that it is a convenient stopover point with no really acceptable anchorage at all. The Drifters’ programme (this makes it sound like a concert or something!) now followed an approximate variation of our own, but one day later. Sunday 30th saw the trio cross via Tinker’s Hole and Iona to Bunessan on Mull, a good stop with pub food but fishing boats unloading throughout the night. This obviously had some kind of inspirational effect aboard Wayward Wind , as her skipper decided to do some fishing of his own the following day. That Monday they all (to the best of my knowledge) landed on Staffa before heading to barbecue Colin’s catch of eleven mackerel at our previous night’s stop on Gometra. This was also the scene of a touching episode related to me by Wilf, in which an exhausted young deer which had become separated from its mother had somehow fetched up on the wrong side of the deer fence. After an epic struggle not finally resolved until the morning, fisherman Colin succeeded (by methods which must remain a trade secret!) in bringing the pair together again and probably, by all accounts, saved the young one’s life. Another tale (this one not observed but overheard) concerns the fishermen on the VHF, a car boot full of fish, a garage, a fortnight’s forgetfulness and a dénouement that would surely be more at home in a horror movie than the pages of DAN! Perhaps, therefore, I should be getting back to the progress of the cruise and tell you that, while Jim, David and myself were out walking on Coll on Tuesday 1st August, the others were of course crossing the Passage of Tiree to meet us. I felt a considerable sense of pride in seeing the fleet assembling at anchor just off the middle pier at Arinagour, as I had long held a desire to see one of the Craobh—Kilchoan cruises make it out to ‘our’ special island. There were in fact seven Drascombes at Coll that evening, including one lugger which lives there and another, Martin Coombs’ Mignonne , which arrived from Kilchoan heading for Tiree. Wilf, Anne, Colin and Ken hired bicycles from the Tigh Na Mara guest house and set out somewhere across the island; ‘to the beach’ they said when they got back, but which beach? To those of you who have never been on a Hebridean island I can only explain that Coll is beaches, and beaches at that of such a rare and breathtaking beauty, abundance and emptiness that they are quite indescribable anyway. Wednesday 2nd August saw the fleet heading at last for Kilchoan, with most of us stopping to take in the little harbour of Croig (near the mouth of Loch a’ Chumhainn on the north coast of Mull) for lunch. There must have been a bit of wind for a while because David’s sun-hat blew into the sea and we had to round up smartly and execute a pretty nifty piece of MOB drill to recover it. Thursday 3rd, however, brought the first really good breeze in days and some fine, blustery racing with the course, for those who are familiar with the Kilchoan Regatta, set in the opposite direction to normal. The wind was fairly howling down off the Sròn Bheag, although there were some amazing holes in it elsewhere to ensnare the unwary. I’m pleased to be able to report that Magic III came home at the front of the fleet to retain the New Zealand Cup for the first Drascombe, hotly pursued in the end (after fighting to clear just such a hole) by the Drifters Mochras and Wayward Wind , completing a clean sweep of the places for Drascombe Association members and proving yet again that Drifters in the right hands are every bit as lively as their centreboard cousins. Friday’s race was a complete non-event for most of us as barely a breath of wind reached the water. The course was shortened to just one round of one tiny triangle and the start was chaos, with a good old gaggle of Drascombes and other craft drifting helplessly into each others’ paths and completely unable to pay heed to the usual rights of way. Some idea of the conditions may be conveyed if I tell you that, after drifting backwards across the line in Magic III seconds before the start gun, we took the best part of half-an-hour to sail back to the buoy, round it and recross the line! The Drascombe race was won by a delighted Iain Peterson in his lugger Kirsty Anne and I must say that the loss of one of my cups was made just about bearable by that, with Iain the first local owner to break the Drascombe Association stranglehold for a number of years. Also going well was Colin Sherriffs in Wayward Wind , and he was rewarded with a second place on handicap for the overall two-day series. Mochras and Magic III limped home long after most of the backmarkers had retired, with nothing but pride in my case keeping us out on the course. The coup de grâce, however, was delivered by Dave Stark in Juniper as he lived up to Stuart’s prophecy of ‘Dave Stark turns up everywhere, so be warned’ by appearing from nowhere to sail serenely into the middle of the power-boat race! A splendid evening was had by all as, one by one, each crew decided to delay the return south and stay for the Regatta Dance. How Colin and Ken managed to get up for a 4.00am start the following morning remains a mystery (although it seems that this may have involved some kind of jugglery with sleeping bags and an autopilot! ), but they were away long before the rest of us were up and back at Craobh that day. Arctic Drifter was heading north and the remaining crews enjoyed a very pleasant run down the Sound of Mull, culminating in an exciting race between Magic III and the Isle of Mull ferry into Craignure Bay, as we saw the chance to put David on an earlier boat for Oban than we had originally envisaged. Here our paths diverged again, with myself turning north-east up Loch Linnhe to make it home later that evening and Kate and Mochras heading south to Puilladobhrain and an unexpected midnight rendezvous with the Clachan Bridge. They reached Craobh on the Sunday morning. Overall it was a magnificent cruise. The words ‘best ever’ spring to mind and have, in fact, been used a number of times since by a number of the participants. The sun shone continuously for most of the first week and all of the second. If we all ultimately used too much petrol and had to pay island prices to keep our tanks full, this was probably a fair price to pay. So there was too little wind, but that at least makes a change! For those interested in distances, the total logged for the fortnight varied from Mochras at 170 miles to Magic III at a good 295 — and this even after subtracting 15% to compensate for an over-enthusiastic log. It should be pointed out, however, that our substantially greater figure includes most of Loch Linnhe in both directions, the rally trip to Easdale, the regatta itself and numerous minor diversions. 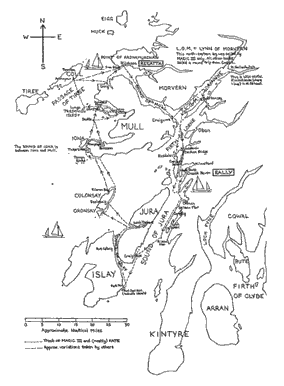 The fleet of five which materialised for the fortnight was probably about the optimum number, allowing the itinerary to be freely discussed and varied at will, with the four nights’ split which followed the Loch Tarbert sea fog a welcome variation. I don’t think that David can have any real idea, however, of what cruising in a Coaster with two can be like when it rains, and for that I am thankful. If there was any dampener at all as far as we were concerned, it was in a purely literal sense of the word as Magic III had been plagued on this cruise by a slow leak from the lower rudder plate. When we took her out a few days later to repair this, we discovered that the plate was screwed to the fibreglass with over-long woodscrews and that it was only really the shanks of these and not the threads at all which had stopped it from moving. It’s a wonder that it had worked for twelve years before it started to leak, and a warning to those of you who straighten your rudders by sailing into rocks! 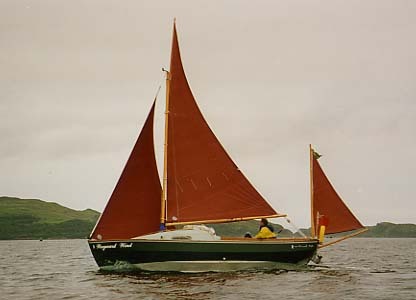 Eight days after her return from Kilchoan, Magic III was sold to Peter Halliday of Tighnabruaich. To all my friends on the water who don’t yet know where that leaves me, I’d just like to suggest that you keep a lookout for Wyvern , my Jaguar 21. We’ll be out there somewhere. The only part of the tale that still remains to be told concerns the continuing adventures of Bob and Yvonne. I hear that, after we left them at Kilchoan, they took Arctic Drifter off on a virtual world cruise taking in, amongst other places on a list far too impressive to quote in its entirety, Muck, Eigg, Loch Scavaig and most of the east coast of Skye. Not only did they survive a mere 508 miles together on this trip, but they were married on 25th October and honeymooned with the Drascombe at Falmouth! I’m sure that I speak for all of us in taking this opportunity to offer them our congratulations and wish them all the best for the future. Since this article was first published, Wyvern has been replaced by Fly (which I bought in November 1998). For this version, I’ve rearranged some of the photos (not all in sequence in the original, two-column, layout), changed all quote marks to singles, cut the full stops from any acronyms that had them, and slightly modified the table of participants, but it’s otherwise identical to the original. And why not check out Jim Hopwood’s photos (accompanying his very abridged version of this article on the Drascombe Association site)? Or take a look at my earlier piece (on this site) about my single-handed cruise to the Outer Hebrides?